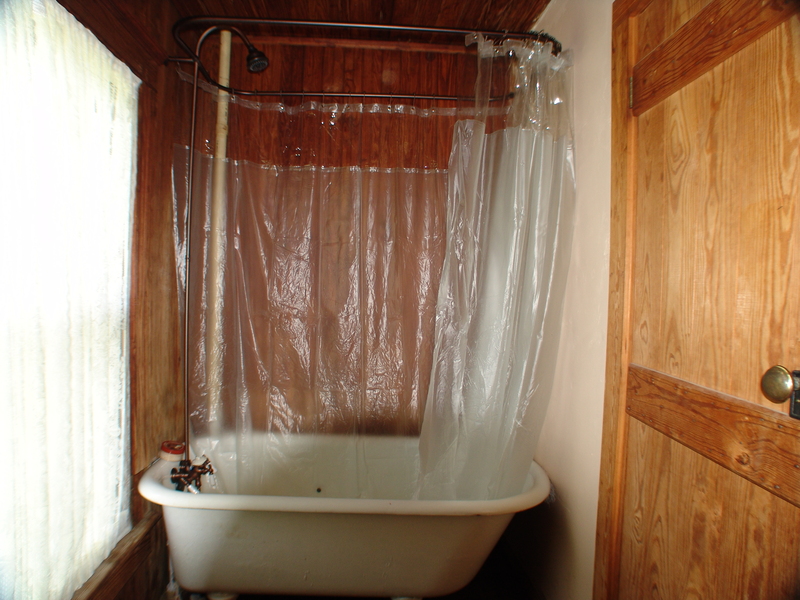 Home » Uncategorized » Indoor Plumbing? 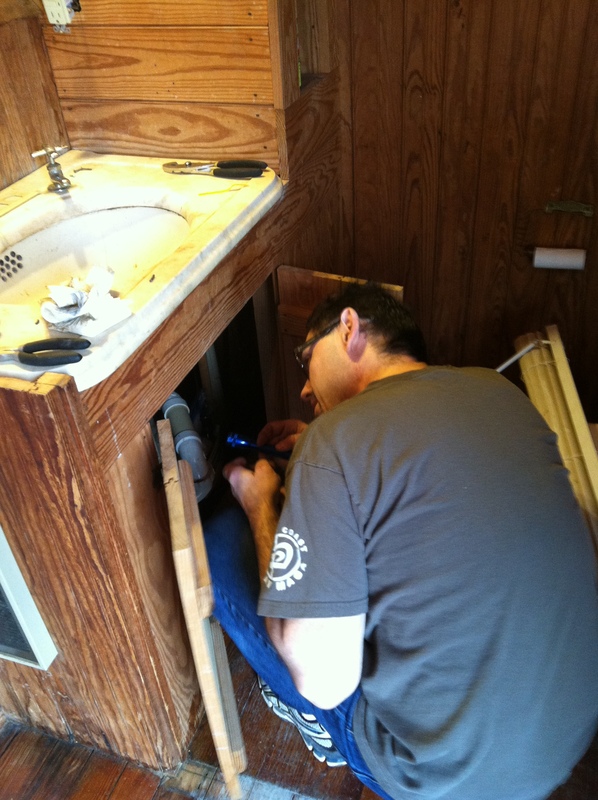 It is clear my least favorite remodel task is plumbing. Nothing makes me more frustrated than working with water lines and drains. I still keep saying “That will be easy” so go figure. 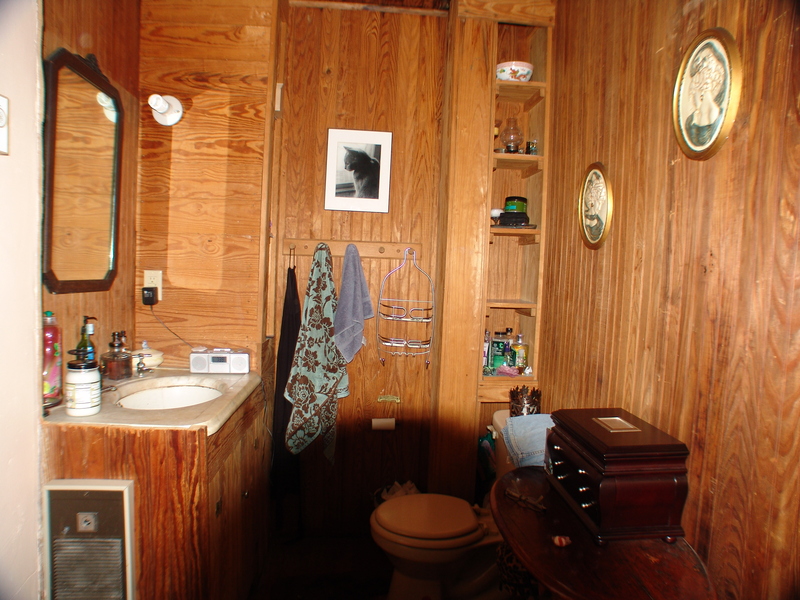 The old bathroom upstairs was small, odd and expendable. We planned to turn it into the pantry for the new kitchen. We removed a wall that separated the tub and door from the sink and toilet so we could use it until we got the new bathrooms built. Once we got it opened up it we saw that we could use this one and use the other space for the pantry(less work for me). Turns out, not so much. Toilet water line leaked, tub water lines both leaked, and we needed a shower in there. Since it was PVC lines I just replaced the lines, twice. We found a shower conversion kit in oil rubbed bronze online so I ordered it. Some of the parts didn’t make sense. The parts weren’t all there and an extra part came with it. After emails, pictures and phone calls over about a month, I finally got the correct system. The bad part was I had run the water lines for the first one and the new one had a different layout. Oh well, PVC is easy. The install after that was painful. The fit and finish wasn’t what I expected for a $500.00 kit. The final result was nice though. Now Rachel has her own bathroom. We found some cool rustic hooks at Holly Hills Antiques to finish off the room. 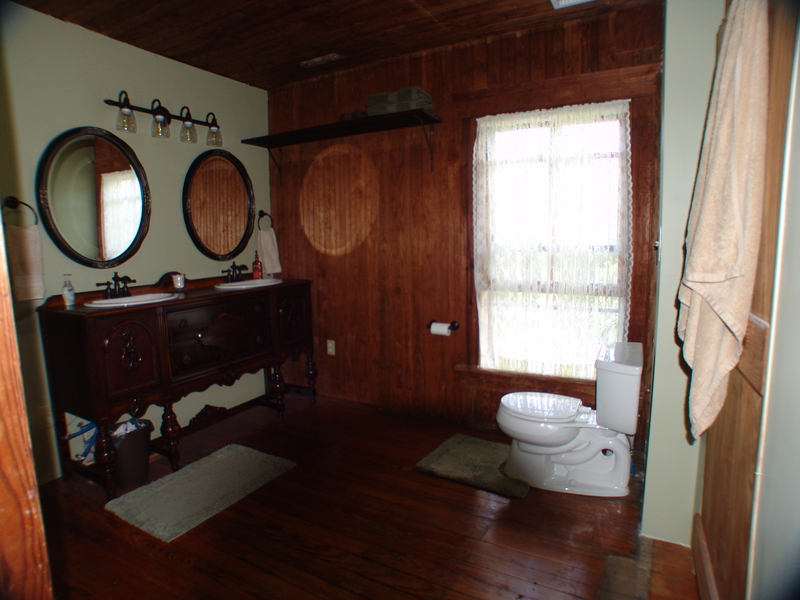 During this time we have all been using the bathroom downstairs for bathing needs. You have to pack a lunch for the trip from the bedroom to the bathroom. My goal was to finish the master bath ASAP. Unfortunately the hot water heater downstairs went out. I had to stop and replace that since it was our only hot water source. We started with the drain that ran from the bathroom that was put in back in the 80s so I put the toilet where to old one had been. Then I had to run a drain for the shower and sinks. My choice for getting water to the room was PEX lines and a tankless water heater. I ran PEX from the basement to the attic and then to the other end on the building. I am glad I did it. Turns out it was pretty easy to run the line and install a manifold. Installing the water heater and wiring for it added to the complexity but I would rather deal with wiring than plumbing. Plumbing, electrical, shower and tub are installed. Now we get to the fun stuff. A store bought vanity wasn’t going to work. We found a sideboard at Essex Antiques & Collectibles in Tappahannock. We got it for $225.00. From there I got two sinks from Lowe’s that would fit and we picked out the fixtures. I cut out two holes for the sinks. I had to eliminate one drawer and shorten the depth on the other for the plumbing to fit. 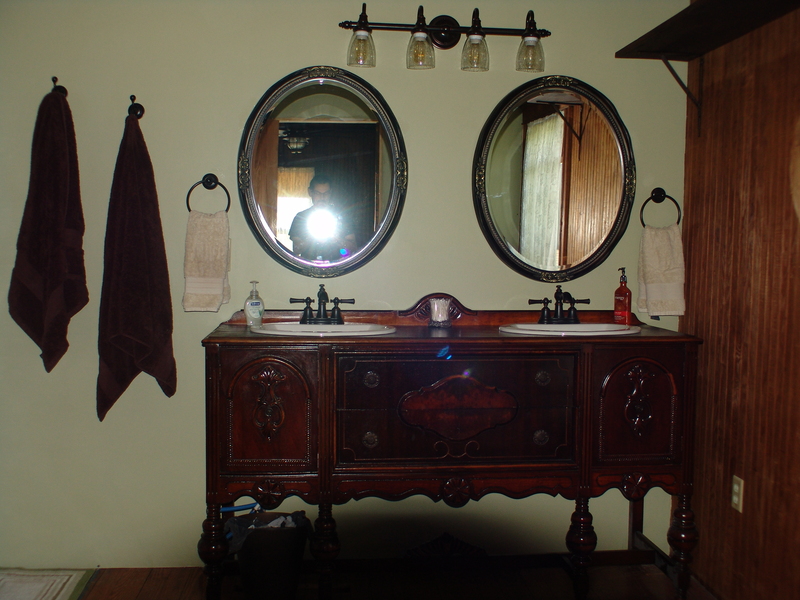 The total cost for the vanity was over $650.00. We love the height and the ability to have two sinks. Now for the great mirror challenge. We have been shopping but were pretty sure we wouldn’t find two antique mirrors that matched so Heidi found two online at wayfair.com and we installed those today. We still have molding and trim to do, but it came together nicely. Looks really nice Robert. Yet again, I’m very impressed by the work you do. Hi there Robert! Wow! 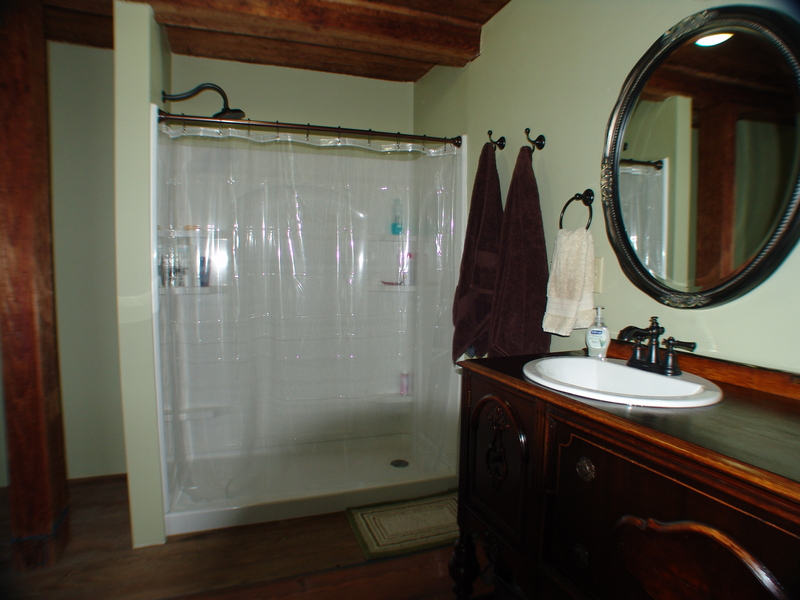 The bathroom you just remodeled looks absoutley beautiful! I certainly had no earthly idea you guys had so darn much talent!! (Well I knew you all had lots of talent…but wow…that explains it, is all I can seem to say! )….we can’t wait to be able to walk around in your new home, and enjoy such beautiful work! We will see you before long and we are all excited about it to! Love and hugs, Mom Doran and critters to! Chicken Saddles and Nesting Box Curtains?